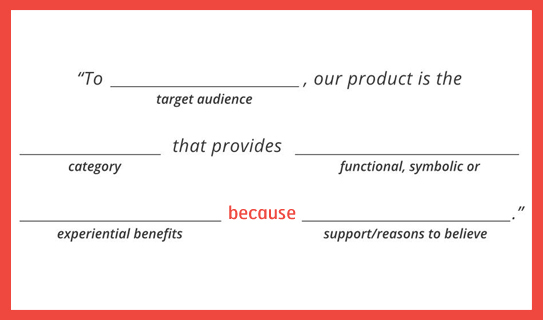 Oh yes, the good old Positioning Statement; used for decades, it still is the single most powerful tool to define a new venture’s audience, category, benefits…and reason for believing. Powerful, because this is all part of one single sentence; a sentence that many Founders struggle with, as a recent poll of ours showed. When I work with clients on defining, and refining their positioning statement as part of our Resonaid™ workshops, it takes between one and four hours to get this sentence right. Yes, power comes with responsibility, and questioning the reason for being, and for believing in any new venture is worth a few hours of pondering. Search for the term Positioning Statement and you will be surprised by just how varied the approaches to a classic branding tool are. It is most astonishing that a majority of statements leave out the most essential part of it; the reason to believe. Most statements focus on the differentiators, ours (pictured above) focuses on the ‘because’ – the part that takes time to ponder and to perfect. It is also the part that will truly differentiate your venture from others. It puts your venture to the test: Is it truly a big idea? Is it important? Can it be bigger? Should it become more important? Is this why I will work late nights and put a lot at stake? The big question ‘Why’ has been making its rounds past the branding community for a while now, most noteworthy through Simon Sinek’s TED talk. Despite its popularity, just like is the case with the mundane idea of writing a positioning statement altogether, the ‘because’, the key part that will indeed generate you sales, is often neglected. If you found an excuse not to tackle this sentence for your venture, take these words as a gentle kick in your behind and make today the day for accomplishing it. It will change your venture for the better, guaranteed. Great post. I’m a big proponent of using this framework. Not only is it great for creating a concise statement of what your brand offers to customers, but it’s a good framework for thinking about how competitors are positioned. “Creating” a positioning statement for competitors is a great exercise to articulate what space they occupy in the market and where there may be opportunity. Also, love Simon’s talk. Epic.